Recently, I had the opportunity to put some (actually, way too much!) time into getting Thunder&Lightning to run again. Unfortunately, since my switch to Mac OS X a couple of years ago, I didn't succeed in getting a working release out. Until today, that is. Get it at the downloads section! As the author of Thunder&Lightning, it is always with a laughing and a crying eye when I look at its home page, where time seems to have stood still since 2007. That very year marked the beginning of my professional career as a software developer, and it also marked the end of a period of twelve years of almost continuous development. No, I haven't given up on Thunder&Lightning. I still think of it a lot and hate to admit that I currently don't even have a playable version at hand. At some occasions I tried to make a stab at it, but I just couldn't find enough time and devotion to work myself through all the technical complexities of compiling TnL again. Despite all the tragedy, thousands of friendly people visit TnL's home page every month, and hundreds download the binary packages. I wish my current project was that popular! Please, answer the poll about your recent experiences with TnL. I have no idea if it is running at all. If you're a software developer, please fork TnL on GitHub and see whether you can get it to compile, especially on Linux. Maybe we won't succeed at first, but we can make incremental progress. If you're a blogger or have social network readership, you might forward my call for help! My long time goal is to be able to provide a runnable version of Thunder&Lightning for all major platforms. BitWrk is an open marketplace for Blender rendering fueled by Bitcoin, the famous internet currency. Please check it out and give it some publicity if you can! The forum on this site has recently (again) become riddled with spam. Thanks to Charlie of Free Gamer fame, the Thunder&Lightning forum has found a new home on FreeGameDev. I hope being relieved of the burden to maintain the forum will give me more time to develop on Thunder&Lightning. In other news: Thunder&Lightning's source code and assets are now maintained on Github. This is what happens if you try to do too many things at once. It has been almost two years since the last news update. Even worse, there hasn't been a lot of progress during that time. Overwhelmed by the sheer amount of work that still needs to go into TnL and having trouble finding the motivation to work on such a large project in my increasingly valuable free time, development has almost completely stalled. I'm a professional software developer and working on software problems half the day makes me reluctant to spend the other half in front of a computer, too. And yet I miss the countless hours spent tweaking missile guidance, enhancing enemy AI, designing futuristic aircraft, writing graphics shaders and creating my own world. It has always been a very creative process. But then there are a lot of cumbersome tasks like maintaining a build system for several target architectures, dependency management and software packaging. I also failed at maintaining a web site. My apologies for the spam-ridden forum which is completely unusable at the moment. Those are what kept me from continuing to work on TnL. In order to get back on track, I must leave some these tasks to others. This is a non-profit work and I don't have a team of software developers at my disposal, so I must trust in the power of the open source community. Let's all work together to make the Open Source games community as great as it deserves to be! Let's make 2010 a year that rocks! Just to prove that there is actually something going on here. 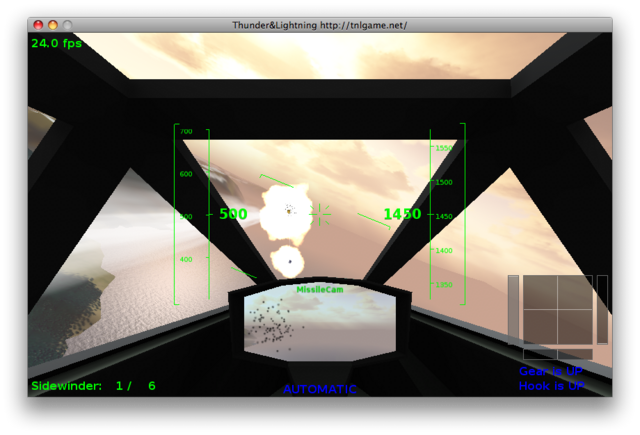 In fact, I have been spending lots of time getting TnL to run on the Mac, I hope it was worth the trouble. But anyway, learning how to use Apple's Xcode was a nice experience. Using Apple's OpenGL driver: not so much. In desperate need of new hardware (my development notebook had broken for the second time in a month) I went to the stores and did something I always wanted to: I bought a Mac. It's a beautiful 20" iMac. I didn't yet succeed in compiling TnL for it though. CEGUI, the game's user interface library, has been causing problems. Any help is appreciated. Just to be clear: I will continue to release first-class Linux releases, including Autopackages. I will also try to prepare a Mac release. I could use help with Windows though, as I currently don't own a development PC with the MSVC suite. Following the recent release of 071031, this bugfix release is meant to solve the dependency problems many users had. Additionally, performance has been significally enhanced by implementing scripting functionality in C++. Read more for the full list of changes.